My custom fit Benock Blue Dragon II putter has arrived!! My putter has arrived!! It's really really nice!! I no longer need to wonder whether a putter is a good fit or not. It's tailored to perfectly fit my stroke! What's also cool is that loft and lie are not just adjusted by bending... my custom specs are implemented via custom CNC milling programming . Thank you Chris for arranging the fitting appointment with short notice while I was in Japan and thank you for the quick delivery as well! Can't wait to take her out on my next round!! Congrats, Nob! Gorgeous putter! Can almost feel the roll through the pictures. Congrats! Can you elaborate on the fitting process please? That's a beauty Nobs has that look of a High Valyrian "Green Slayer" Need a better look at the face. Thanks!! This is their standard bead blast finish. The other standard finish is a more shiny finish which I believe is pretty much straight out of the millimg machine. Though the raw finish would have been cool, I didnt want the reflection to bother me on sunny days. They also have a black finish as an added option. Of course!!! I'll have to dig up my notes but think about a full swing analysis done with your driver and irons and imagine doing the same for all variables associated to your putter stroke. Its interesting to know why some putters work better for you over others! I am very much hoping that it will become my Birdie generating weapon! Thanks!! believe it or not, pictures do not do justice! its pure perfection in the flesh!! First round with my Benock putter last evening. I did not bother bringing up my Benock story since I wanted to focus on how my new putter was going to perform for me. Unfortunately, the greens were a on the slow side. So it wasn't really a good condition for testing out putting. However, one thing, I think, is for certain. "Ball starts off on the line that I intended to hit." That seems stupid obvious .. but it was not as automatic with my previous putters. With my previous putter, I would have to adjust and somewhat "hope" that the ball started off on the intended line. That's a pretty good sign for me and an overall confidence booster for my stroke. I can actually trust that my stroke will start off on the intended line. Feel at impact is just right for me. Dense and solid but with a sensation of smoothed out edges. Geo Galaxy has a bit more raw and direct feel. So far so good but need to try on faster greens. good to hear. ive been using.mine alot on hols.i need to re do.the shaft tho . its.too light with a freq.filer in it. going to put an ns heavy on it , give it somr.extra swing weight , one thing i love is its feel., very dense very true. love the milling pattern too. If you guys are up for it, would love to see more pics. 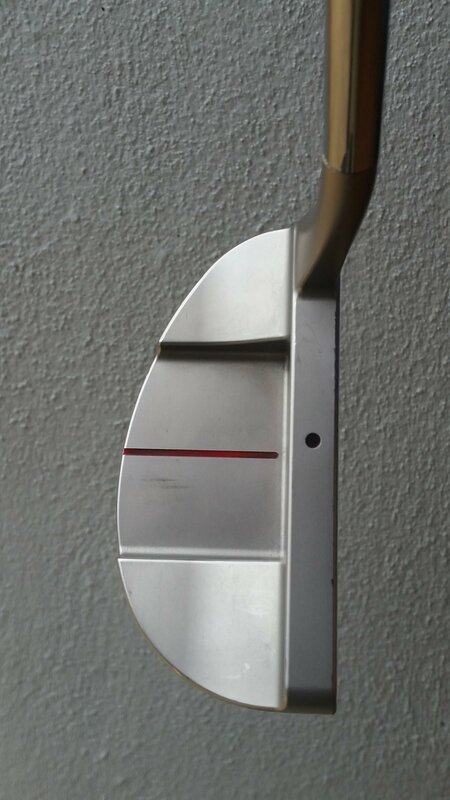 I dig this putter and the milled face. Is it "face balanced" and did you go in for the Fitting too? Id be interested in your impressions. Interests:Meditation, golf, my wife, my work. Simple, clean. Great golf gear. Quote: I kept my wife. That means I can change golf gear whenever I want. Nob did you go to Japan or do this virtually? Nevermind. It's in your post. I have family there so I try to go every Summer. This has always seemed to me to best the best process in the whole exotic putter world.